Rebecca Gilbert, Peter Burritt’s second wife, also had this building built in 1908 and she named it in memory of her first husband. It was considered one of the first “skyscrapers” in Fox River Valley. The building was designed by Gilbert Turnbull and is considered “Chicago School”. The 5-story building features a pair of 4-story symmetrical bay windows, ceramic wall tiles, and an atrium. The upper office floors were left unfinished for 84 years. 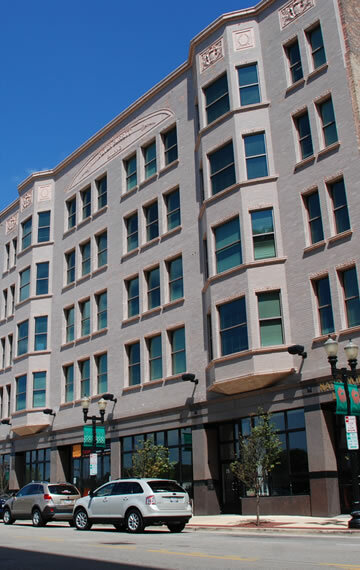 In 1998, the building was acquired by a local developer, PanCor Construction & Development of Elgin, which usually builds new office space from the ground up. Architects, Wold Architects and Engineers, took the vision of meet the corporate needs of a growing community by designing a Class A office space. Today, after a 105-year wait, Peter Burritt’s request has been fulfilled. The building stands with a new facade and finished floors for the first time in its history—ready for the new millennium and its next hundred years. While the exterior and the lobby of this building are quite impressive, don’t stop there! Be sure to venture up to Dewberry’s office on the 5th floor to completely embrace the beauty of this building. Chicago’s architecture is famous throughout the world and one style is referred to as the Chicago School. It is also known as Commercial style. In the history of architecture, the Chicago School was a school of architects active in Chicago at the turn of the 20th century. They were among the first to promote the new technologies of steel-frame construction in commercial buildings and developed a spatial aesthetic that co-evolved with, and then came to influence, parallel developments in European Modernism. While the term Chicago School is widely used to describe buildings in the city during the 1880s and 1890s, this term has been disputed by scholars. Contemporary publications used the phrase Commercial style to describe the innovative tall buildings of the era rather than proposing any sort of unified school. One of the distinguishing features of the Chicago School is the use of steel-frame buildings with masonry cladding (usually terra cotta), allowing large plate-glass window areas and limiting the amount of exterior ornamentation. Sometimes elements of neoclassical architecture are used in Chicago School skyscrapers. Many Chicago School skyscrapers contain the three parts of a classical column. The first-floor functions as the base, the middle stories, usually with little ornamental detail, act as the shaft of the column, and the last floor or so represent the capital, with more ornamental detail and capped with a cornice.